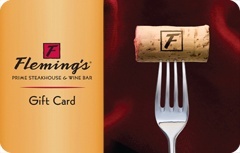 Fleming's Prime Steakhouse & Wine Bar Gift Cards are perfect for any special occasion! Whether it's a birthday, anniversary or simply a thank you, treat family and friends to an evening they'll remember. People love Fleming's Prime Steakhouse & Wine Bar Gift Cards because they know they are in for an unforgettable dining experience. Fleming’s serves the best USDA Prime beef, perfectly aged to bring out its full natural flavor. To heighten your enjoyment, select the perfect wine from the Fleming’s 100® award-winning wine list. Fleming’s secret is flawless execution of simple recipes, using premium ingredients. Fill out your meal with delicious side dishes or split some of their famous appetizers. Add in Fleming’s doting service and attention to detail and it’s easy to see why Fleming's Prime Steakhouse & Wine Bar Gift Cards make great gifts for your friends, family and business contacts anytime.